(Phys.org)—A team of researchers at Washington University in St. Louis has built a camera apparatus capable of capturing moving imagery of an optical Mach cone. In their paper published in the journal Science Advances, the team describes their image capturing system and other possible applications of the technology. Most everyone knows that when an object like a jet moves faster than the speed of sound, an acoustic cone is created in its wake that can be heard as a sonic boom. Scientists have theorized that the same type of phenomenon could occur with light, but until now, have not be able to prove it by capturing images of it in action. 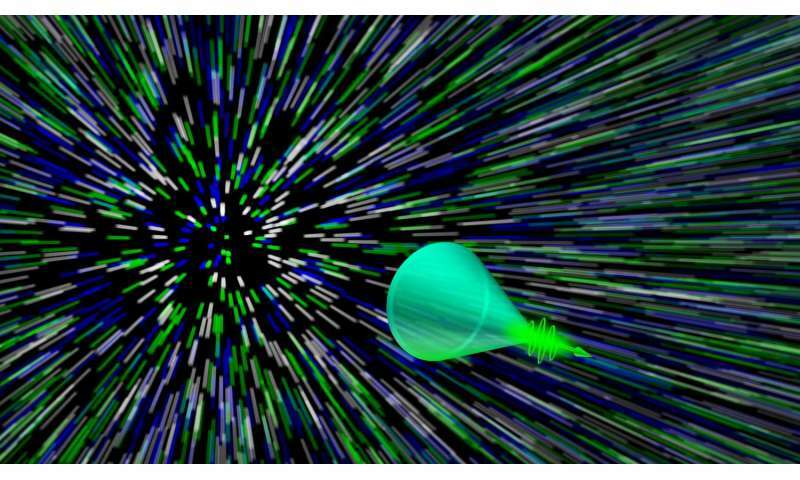 In this new effort, the researchers have done just that, and have developed an image capturing system capable of taking images of other ultrafast events, as well. To capture imagery of an optical Mach cone, the researchers approached the problem from both sides—by developing a superfast imaging system and by slowing down light. The second part was easy; all they had to do was shine a laser through a medium—in this case, a tunnel with dry ice particles that was placed between plates made of aluminum oxide powder and silicone rubber. The light from the laser subsequently traveled faster as it moved through the tunnel compared to the plates, allowing for the formation of an optical Mach cone. To capture imagery of the cone, the researchers installed three CCD cameras next to the cone-generating apparatus, one of which was a streak camera (it works by converting photons to electrons and bending the path they take). 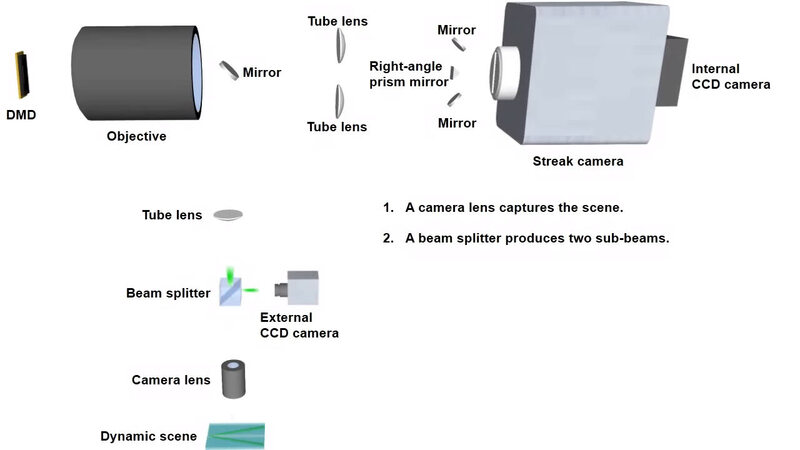 The streak camera was also fitted with patterned filters that allowed for capturing still 2-D sequences of images, each of which was assigned a code—after a cone was created and imaged, a 3-D image of it was created by combining the 2-D pieces in ways reminiscent of a CT scanner. The other two cameras were used to provide more perspective and to improve resolution. The result of the effort was the first ever video of the cone-shaped wake of light known as a photonic or optical Mach cone. The researchers suggest the same technique could be used to capture imagery of other events such as individual neurons firing—they note it is capable of capturing images at speeds up to 100 billion fps. 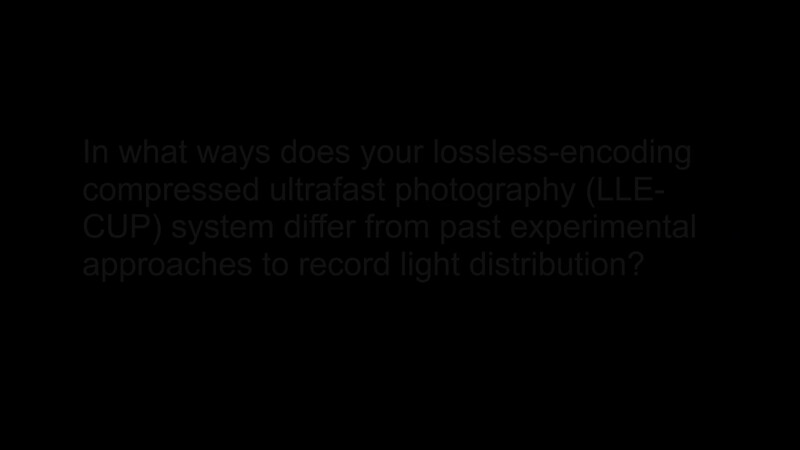 Ultrafast video recording of spatiotemporal light distribution in a scattering medium has a significant impact in biomedicine. Although many simulation tools have been implemented to model light propagation in scattering media, existing experimental instruments still lack sufficient imaging speed to record transient light-scattering events in real time. We report single-shot ultrafast video recording of a light-induced photonic Mach cone propagating in an engineered scattering plate assembly. 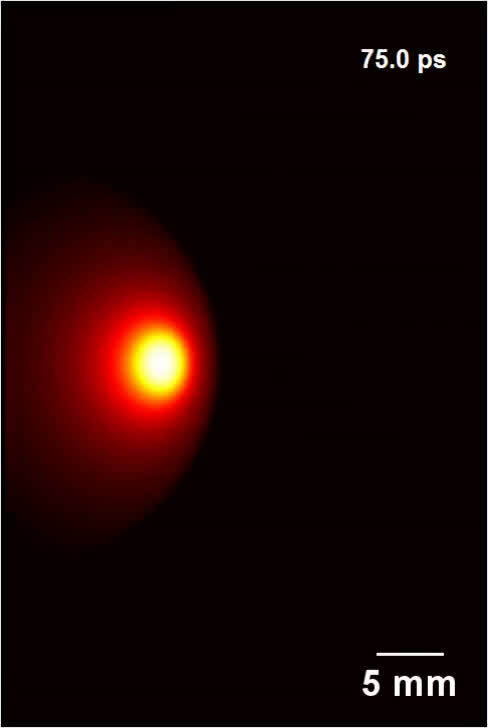 This dynamic light-scattering event was captured in a single camera exposure by lossless-encoding compressed ultrafast photography at 100 billion frames per second. Our experimental results are in excellent agreement with theoretical predictions by time-resolved Monte Carlo simulation. This technology holds great promise for next-generation biomedical imaging instrumentation. Scientists have theorized that the same type of phenomenon could occur with light, but until now, have not be able to prove it by capturing images of it in action. Hmm, I thought that experiments like the Kamiokande detector worked on the principle of detecting such cones - and that such cones had already been seen there. So this isn't just 'theorized'. Where does this weird terminology come from? A Mach cone is an artifact of a concept from Newtonian compressible fluids. How do the researchers know that this isn't a Froude number (similar to Mach but for Incompressible fluids)? Furthermore, this is an electro-magnetic concept, not a concept of fluids. I am often critical of people who make up new names for the same old stuff. However, in this case, they reused names and concepts that really have nothing to do with what they are working on. This is why science gets so confusing. When young I was taught to estimate exhaust speed by counting the 'diamonds' in the stream. Seeing the title I this article I was perplexed and had to find out. No, they are not assigning Mach numbers to electromagnetic propagation rates. Whew, I am too old to be learning new names. A Mach cone is an artifact of a concept from Newtonian compressible fluids. A Mach cone is something you get whenever you can have a shockwave effect (which in turn means whenever something exceeds the local maxium speed). Be it sound, speed of light or whatever. You can get Mach cones in solids, liquids or gases. Compressible fluids do not define Mach cones. Mach cones are just something that can also happen in compresssible fluids.